Welcome to this week color challenge at The Play Date Cafe. Our colors are Plum, Mustard and Rose. I was inspired by the fan in the inspiration photo. It's been so hot here for the past week, that I thought I could really enjoy a fan like this. Plus, I decided my one word for 2013 is Enjoy! 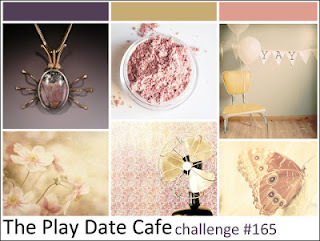 This week's winner will get an EXTRA special prize from The Play Date Cafe prize vault. I hope you will be able to join us this week. I can't wait to see what you create!! Great take on the colours and the fan Donna! Love that embossing too! i love this! 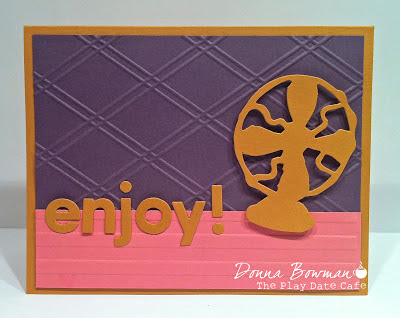 the die cutting is perfect...and i love how you interpreted the color combo. awesome cas design!